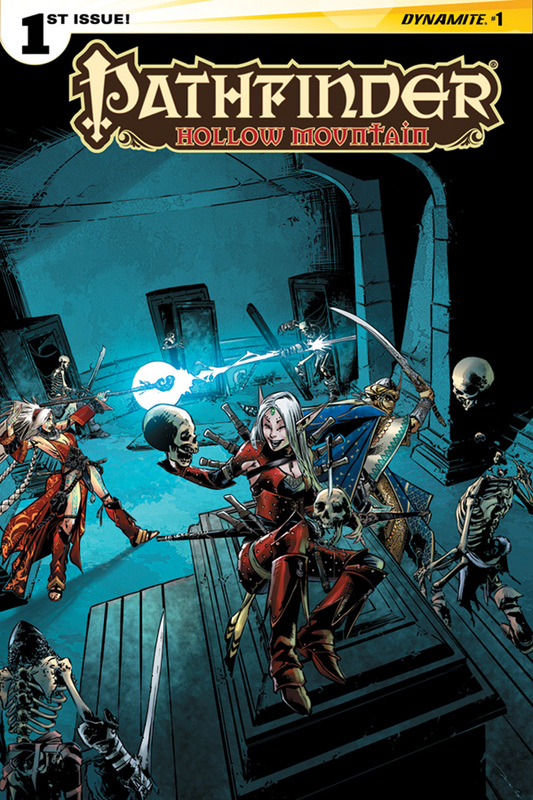 Dynamite Entertainment, a leading publisher of comic books and graphic novels, and Paizo, Inc., the premier publisher of tabletop roleplaying and adventure card games, are proud to announce the upcoming November release of Pathfinder: Hollow Mountain #1, the first chapter in a six-issue comic book miniseries. The series will be written by the collaborative team of game developers Erik Mona (Paizo Publisher and Chief Creative Officer), F. Wesley Schneider (Paizo Editor-in-Chief), and James Sutter (Paizo Senior Editor), and feature artwork by Tom Garcia, recently the illustrator of Patricia Briggs' Mercy Thompson: Hopcross Jilly. 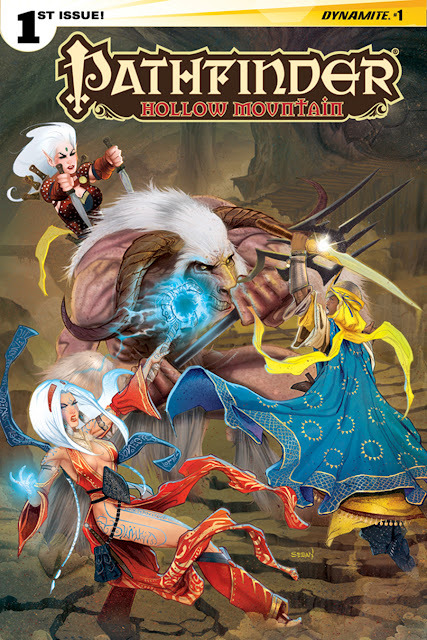 Each issue contains an RPG appendix detailing part of the Hollow Mountain dungeon (with poster map) and a write-up of one of the new characters. Hollow Mountain draws iconic Pathfinder heroes Valeros, Seoni, Kyra, Merisiel, and more deep into an ancient fortress built by the runelords, the archvillains of the franchise. Carved in the immense visage of Alaznist, Runelord of Wrath, the Hollow Mountain is home to a honyecomb labyrinth of trap-laden chambers and corridors. 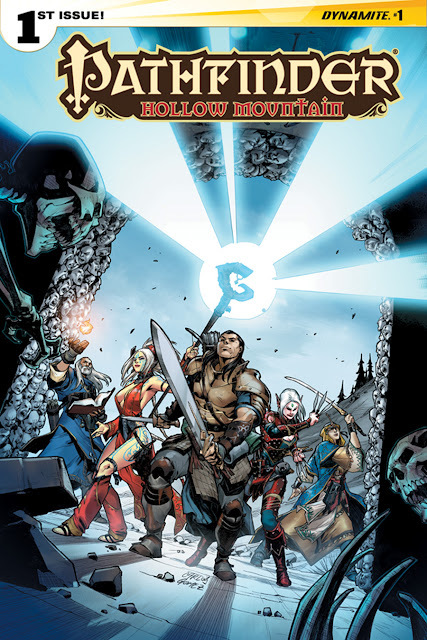 The team of Pathfinder agents must explore the ruins in search of a magical artifact from the runelords' day, but they aren't the only adventurers interested in the mountain's secrets. Open combat between the rivals will ensue... but Alaznist has not left her former stronghold unprotected, and fearsome guardians will force some rather uncomfortable alliances. 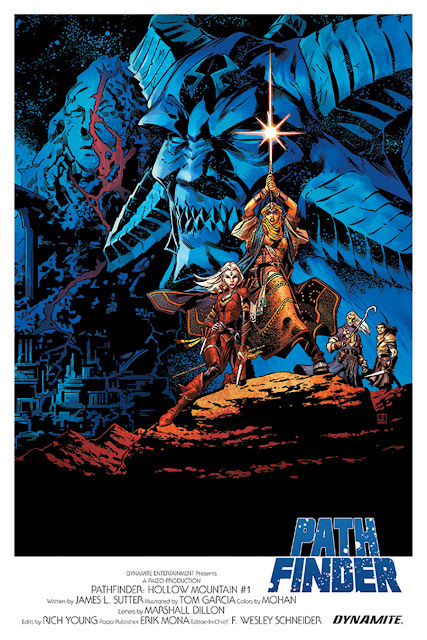 Co-writer James Sutter says, "Erik, Wesley, and I are really excited to be writing together again; while we got to team up to write Pathfinder: Origins, each of those issues was its own story, focusing on the characters' pasts. With Hollow Mountain, we're pushing things forward in a single storyline, and we've been busting out the whiteboards and flow charts to pack in as much action and character development as possible! And since we're some of the folks who built the Pathfinder setting in the first place, we're really able to dig into the canon and spotlight elements players and readers have been waiting for, from the lost empire of Thassilon and its magical Runelords to the sinister Aspis Consortium. 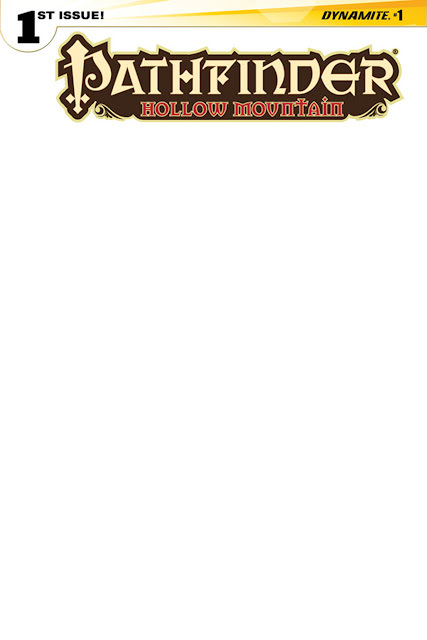 Hollow Mountain is one of the biggest, most legendary dungeons in the setting, so in addition to throwing the heroes into that meat grinder, we're also going to be exploring it in the supplementary material in the back of each issue with new mapped encounters, plus information on the Runelords and stats and backstories for the issue's iconic villains, so players can fight the bad guys themselves!" "This latest Pathfinder series has got me excited, not only because we're introducing more badass iconic characters to the comics, but also because the iconics will be battling each other directly," says Dynamite series Editor Rich Young. "It's going to make for some great action and dialogue between the characters. Artist Tom Garcia is also delivering some really sweet, detailed pages... it's going to be a visually impressive book. And the fact that Erik, James, and Wes are back on board writing this series after doing such a great job scripting Origins means that Hollow Mountain is going to have some fun surprises, and be as true as possible to the game. No one knows Pathfinder better than these guys!" 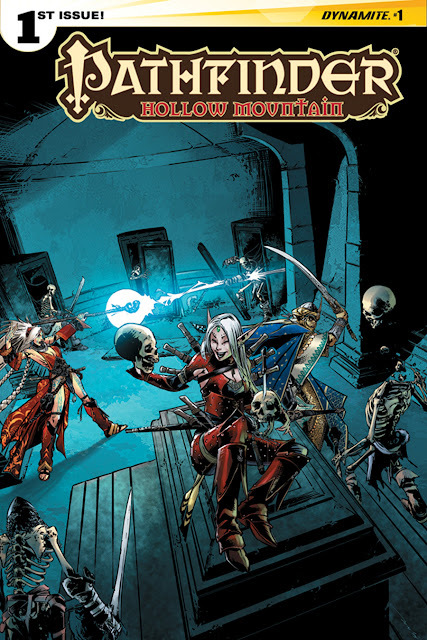 Pathfinder: Hollow Mountain #1 will be solicited in Diamond Comic Distributors' September Previews catalog, the premiere source of merchandise for the comic book specialty market, corresponding to items shipping in November 2015. 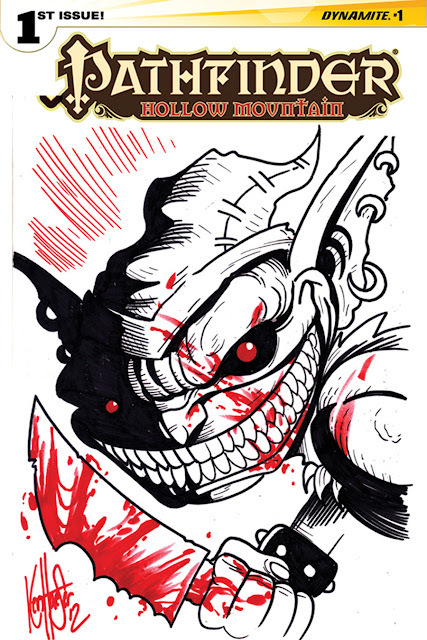 Comic book fans are encouraged to reserve copies of Hollow Mountain with their local comic book retailers. Pathfinder: Hollow Mountain will also be available for individual customer purchase through digital platforms courtesy of Comixology, Dynamite Digital, iVerse, and Dark Horse Digital.